In a law student’s life, internships are as important as passing the final exams. It’s a learning experience and provides a peek into the tough world that they’ll be getting themselves into. If you fantasize about being a hot shot successful lawyer like Harvey Specter or Mike Ross, well, reality is going to hit you hard. Building a career in law is hard and bluffing and badass dialogues can’t help you in reality. Here’s a small guide to help you land the perfect legal internship and kick start your career. Law firm internships: It includes internships at various corporate and litigation law firms. Ideal if you want to make a career in law firms. Court internships: Court internships primarily include an internship at a district court, High Court or Supreme Court under a lawyer’s guidance. It’s recommended for those students who wish to join judiciary or litigation as it provides them practical exposure to judicial procedure and its technicalities. Public Sector Undertakings: Various PSUs like ONGC, HPCL, and BPCL including banks like SBI offer internships to law students. NGOs: NGOs offer internship opportunities to law students and contributes in providing valuable insights in particular areas of law like international conflict management, human rights, hunger or health care. Government internships: Apart from the above-mentioned categories various government departments offer internships to law students. The prominent being Ministry of Finance, Competition Commission of India, Ministry of Corporate Affairs etc. Research –Research about the ranking and performance of the firm you are applying to using various online resources like RSG rankings and The Legal 500. Talk to your seniors in college and learn about various firm and roles that they offer. If possible enquire about the mentor and the kind of exposure and experience you should expect working for them. Pay close attention to language – Applying to regional court of an area when you don’t know the local language is a big no. Be very particular about this and choose the language you are comfortable with or you might end up relying on someone else to translate everything for you. Through Application –Drop an email with a cover letter and curriculum vitae to the HR’s mail ID. And do not forget to follow up. Schedule a catch up with the firm after a while. Sometimes, you need to keep reminding the recruiter to review your application and reply. Show them that you are eager to work with them. Under judges – You just have to forward your CV; however, you need to adhere to certain formal requirements. One can also apply through the High Court Registry. You are required to send your CV along with a covering letter by post. With the prior permission of the judge, the application is forwarded to the registrar of the court. After examining the documents the office grants the permission to intern. Through Campus – Sometimes you have an option to apply for an internship at your favourite firm through campus. The applications through campus generally get a faster reply and more consideration. Good oratory skill and the ability to go through large documents with complex information are the skills that the firms and associates look for in an intern. A lawyer should be able to put across the points in a clear and concise manner in front of the courtroom. 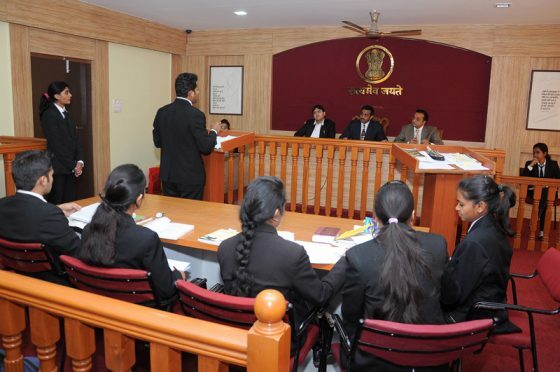 The best way to develop these skills is by participating in moot courts. The amount of emphasis given to the moot courts in a fresher’s application is huge. Participating in a moot court not only helps you develop these skills but also helps you increase your network and meet like-minded people. Find and register for some of the best moots here. With the international law on the rise, it is advisable that lawyers take up learning a language or two. A pre-requisite as a good lawyer is the ability to produce compelling arguments, briefs, motions, and other legal documents. Following the sites and channels like Legally India, Bar & Bench, Live Law, SuperLawyer, Indian Kanoon, and Mylaw and being up-to-date will help you crack the interview. Don’t be picky about the nature of the tasks assigned to you. Don’t be disappointed if a partner asks you to perform a seemingly minor task — compiling documents, recording information, or researching on a straightforward legal issue. Treat the task as a gateway to other work opportunities. Build on that first task as a way to being more involved in the transaction. Right from understanding basics like filing and analyzing to drafting and writing legal advice, your mentor will be your go-to person for everything during your internship period. She will be the person you will learn from. Keep in mind that this is your chance to observe and learn from actual practicing attorneys. It is also your opportunity to get to know the law firm, its culture, its people, and its various practice areas. And if you perform well, you might end up with a PPO (Pre Placement Offer) in hand. Now that you know everything about law internships, register here and apply to these law internships.